Local customers can be key to your business success. With nearly 83% of households using search engines for shopping purposes, hundreds of small businesses are creating websites to get noticed. However, a surprisingly small percentage of these companies realize there is little point in advertising to anyone but those who live nearby. An ad for a plumbing business placed in the newspaper in a town hundreds of miles away makes no sense and the website ads aren't any different. Just because everyone can see it doesn't mean they should. By focusing on local customers, a much higher percentage of visitors to your site will be interested in purchasing something, cutting down advertisement costs and making you more money. Optimizing your site for the local search results will help to position your business to the people who matter to you the most. 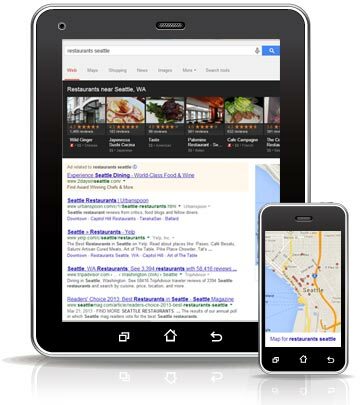 Local search results will help position your business for the people who matter to you the most. While some companies find that they can easily sell to long distance buyers, many have no reason to target anyone but those close to them. For example, a person looking for a good restaurant heads to Google to find one nearby. If you spent the past five years targeting the word "restaurant," your restaurant could potentially show up on this person's search. That's great, until you realize they live halfway across the country. Instead of going after generic terms, we help you localize keywords for people who are close to you. If someone in Boston finds your Seattle restaurant, chances are they won't stay on the website for long. Rather, we can help your website attract people nearby who could plausibly eat at your restaurant. Doing so will provide much better information for further optimizing your website and helping you grow your online presence - not to mention bringing in more customers. Many people look to the internet to find local businesses so it's important to establish yourself online. The best way is to treat the web as a form of advanced phonebook and don't try to do too much. We focus on marketing to people in your city looking for your product while being as specific as possible. 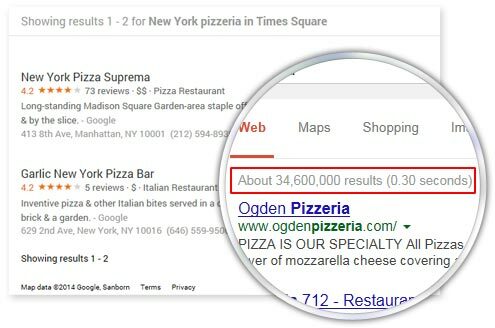 Searching "pizzeria" will bring up millions of results but "New York pizzeria in Times Square" will have much less. While you'll always have someone trying to sell the same product as you, there is significantly less competition over specific search terms, which gives you the option of getting noticed more often. Along with choosing the right keywords, we can help you post high quality pictures of your business and work on getting good reviews. Recent Google updates now take these two extra factors into account when displaying search results, and are invaluable for getting an advantage over the competition. A determining factor in having your site show up on search results is your relevancy to what is being searched. We revise and rework on-site content and meta tags to increase relevancy in the eyes of search engines, optimize the local page and include videos and pictures of your actual location which will benefit both rankings and visitor engagement, and obtain citations (mentions of your business name, address, and phone number) will help raise places page visibility due to what search engines would call increased "popularity" of your business. We also work to locate and request to consolidate duplicate listings so all reviews and citations will be counted towards one location, all aimed toward increasing your local relevancy. If you have a local business with a physical, let us help you grow your business and gain new business daily.